Instagram reportedly plans to start supporting much longer videos. It's one more example of the platform growing its reach -- and its revenue opportunities. Facebook's acquisition of Instagram in 2012 for $1 billion looks more and more like a steal. Business schools will one day be studying the growth of Facebook's (FB - Get Report) Instagram -- assuming they aren't already doing so. Instagram's evolution in recent years is a brilliant case study in expanding a consumer service's addressable market without changing its core identity or alienating a large chunk of its existing users. And judging by some recent announcements and reports, Instagram is keeping its foot on the pedal when it comes to launching new services meant to help grow its user base and/or engagement. Assuming its ad services keep changing as well, that's yielding a strong argument for valuing the photo/video-sharing platform at more than $80 billion, and perhaps closer to $100 billion. A new video initiative is the latest sign that Instagram's runaway success isn't stopping it from making big changes to its platform. The Wall Street Journal reported on Tuesday evening that Instagram, which currently caps video length at 60 seconds, is prepping a new feature that could allow videos up to one hour long to be shared. Like Instagram Stories (and unlike Facebook's Watch video platform), the feature will reportedly feature phone-friendly vertical videos. The following evening, TechCrunch reported that the video platform, like Snapchat's Discover, is meant to showcase professional content such as scripted shows and music videos, and is tentatively set to be unveiled on June 20. The story also noted that Instagram has been "meeting with popular social media stars and content publishers," and plans to let creators monetize their content. The two reports come five weeks after Facebook unveiled several new features for Instagram at its F8 developer conference. They include support for group video chats and the Camera Effects platform for adding augmented reality (AR) content to photos and videos, as well as a revamped Explore tab that uses AI/machine learning to organize content based on topics of interest. In recent weeks, Instagram has also added an option to share third-party posts via Instagram Stories, and has begun rolling out a feature that lets users pay for items without leaving its app. This column has been updated from June 6th to discuss TechCrunch's report on Instagram's plans for a professional video platform. Change has very much been a constant for Instagram, as long-time users can attest. Over just the last few years, Instagram has added Stories, a live-streaming feature, support for Snapchat-like disappearing messages and face filters, the ability to share up to 10 photos or videos in a post and the ability to follow hashtags of interest (Instagram's algorithms try to show interesting posts containing a given hashtag). In a nutshell, Instagram has gradually evolved from a social platform that encouraged the sharing of a limited number of photos and short-length videos, to a much broader platform for sharing and consuming media content. Stories has played a big role in this evolution, but so has Instagram's effective use of algorithms to showcase content users are likely to find interesting and keep them from feeling overloaded. 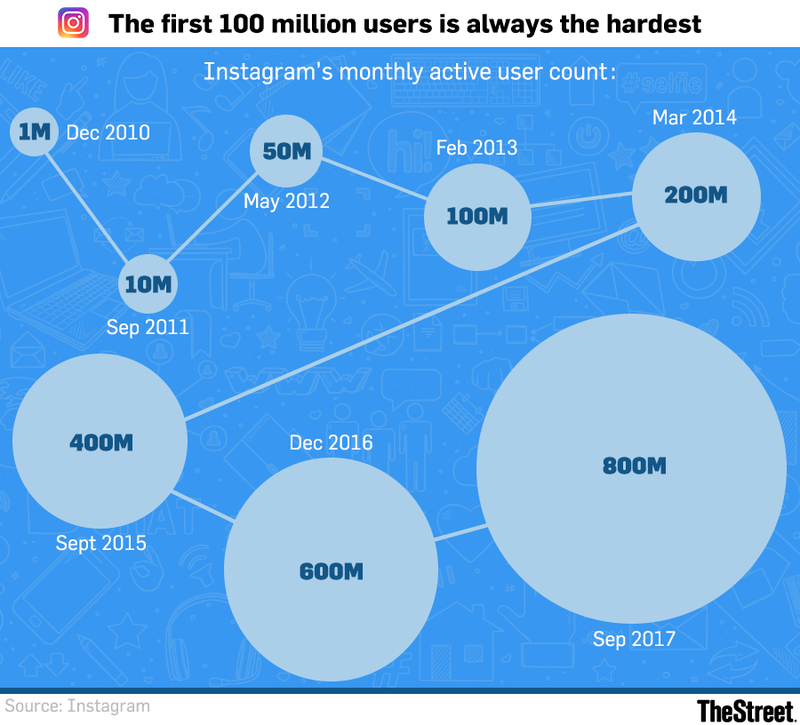 As Instagram has carried out this shift, its user growth has been meteoric: Monthly active users (MAUs) rose from 100 million in February 2013 to 400 million in September 2015 to 800 million in September 2017. Crossing one billion MAUs appears just a matter of time. Instagram's daily active users (DAUs), meanwhile, have surged past 500 million. This includes over 300 million DAUs for Stories, which is well above 191 million DAUs Snap (SNAP - Get Report) claims overall. And last August, Instagram disclosed that users under the age of 25 spend more than 32 minutes per day on average on its platform; those 25 and over were said to average about 20 minutes per day. All that activity has never been more valuable to Facebook, which has both stopped significantly growing its news feed ad load (the number of ads shown during a given amount of news feed scrolling) and has begun seeing usage rates among younger demographic groups come under pressure (this was the case well before the Cambridge Analytica scandal broke). Mark Zuckerberg & Co. have responded with news feed algorithm changes and other moves meant to encourage social interactions and sharing, and cut down on passive consumption of shared brand and publisher content. This is a smart long-term move, but one that's naturally expected to weigh on engagement in the short-term. As it does, Instagram is around to help pick up the slack -- particularly with younger consumers in developed markets. Meanwhile, based on both anecdotal observations and comments from Facebook's management, the ad load for Instagram's feed remains well below Facebook's news feed ad load, and has a fair amount of room to grow. And the company is still only in the early stages of monetizing Stories content. New service launches also stand to help Instagram grow its top line. Support for Camera Effects and face filters could allow Instagram to sell Snapchat-like sponsored lenses and filters to advertisers. The payments feature could improve returns on ad campaigns and thus motivate brands, retailers and small businesses to up their Instagram ad spend. The reported long-form video feature is a natural fit for the kind of mid-stream video ads Facebook has begun showing within Watch videos. All of that makes the case for Instagram meriting a valuation close to $100 billion look fairly compelling. Assuming Instagram is now near 900 million MAUs, valuing it at $90 per MAU -- Twitter's (TWTR - Get Report) current per-MAU valuation -- would yield a total valuation of around $80 billion. And Instagram's user and revenue growth have both been much stronger than Twitter's. On a price-to-sales basis, an $80 billion valuation would make Instagram worth less than eight times research firm eMarketer's 2019 Instagram revenue estimate of $10.9 billion. That's slightly less than what Twitter and -- in spite of big lingering questions about its long-term profitability -- Snap trade for relative to their consensus 2019 revenue estimates. Regardless of the exact valuation one assigns to Instagram, its $1 billion 2012 acquisition price has clearly proven to be one of the best bargains in tech M&A history. And at current levels, Facebook's stock doesn't seem to fully account for the value of a platform that's doing much to protect its flank, has a lot of headroom to grow existing revenue streams and appears poised to open up some major new revenue streams.